City Council unanimously approved the new DC Bylaw and changes to the Erlton Area Redevelopment Plan, and rejected our community’s objection to commercial traffic on Erlton Road. If you follow the link below, and click on item 7.15, the City and public submissions are available in PDF format. If you have an interest in any aspect of this development, we urge you to appear before City Council and state your position. Good afternoon, please find attached my submission to the proposed changes to the Erlton ARP and the Direct Control District bylaw governing Erlton. I have been trying most of the day to send this file but due to the size(19MB) the City clerk would not receive it. I have consulted with a friend who has changed the file size for me. I apologise for the late submission. I respectfully ask that my submission be accepted. I believe it contains valuable information enabling an informed decision to be made. Please accept this email invitation to Anthem Properties’ upcoming Public Information Meeting (PIM), which will be held in the Riverview Room at the Talisman Centre on Wednesday, May 21st from approximately 6:00 pm – 7:00 pm. This brief meeting will serve as an information session on the DC Bylaw and ARP Amendment, prior to the Public Hearing which is scheduled for June 9th, and is open to all Erlton residents. If you could kindly confirm whether you and any others in your party are able to attend the May 21st open house, it would be much appreciated. The Erlton Community Association’s comment is attached. All good input and I really appreciate the work involved in producing this kind of analysis. Just today I was discussing what effect the construction process will have on traffic in the area. As developers do in all parts of the city, likely Anthem will hijack existing lanes of our streets for upwards of 5 years as they use our City streets as staging for their building purposes (eg. 26th Ave “the River” and 2nd St and 13 Ave). We lose street parking, pedestrian sidewalks and access nightmares in our own neighborhood. I like the maps of possible traffic flow. I think it is ultimately necessary to take at least two lanes of property from the south end of the development (along 25th Ave) to create access lanes. Perhaps this can be done first, thereby giving the developer some where to park the construction trailers and trucks. All I have seen so far is the pretty pictures of what will/may be the end result. I would also like discussions on what will be compromised to get there. OUR CITY is very bad at allowing all sorts bylaw infractions because they don’t consider what developer may wish to do in the building process (ie the ATCO trailers parked illegally on park land – “The River” project)…and don’t get me going on that project (“the River”) and the stupidity of allowing such a massive project right up against the river. I would not live there, even rent free. Thank you, Brette, that would be great! I think the most obvious concerns with the increase in restaurant size would be the negative effects of the reduction in required parking, and noise due to the proximity to residences. Also, I would greatly appreciate it if your Board would review the Erlton Community Association’s Erlton Road traffic submission below, and let us have your Board’s comments on it – thus representing the residents in your complex. The City advised a few weeks ago that Anthem is again reviewing their Transportation Impact Assessment – that’s what is delaying a decision from the City. At some point we will need to agree or disagree with the City’s decision on Erlton Road traffic, and we would like a clear understanding of the position of those (Waterford residents) most affected by any decision. I’d be interested in attending and reporting back. We have our Waterford Board meeting on the 24th (in the evening). I could meet earlier on the day though…not sure what time they were thinking? These proposed changes may impact restaurant uses in the Anthem development. Does anyone have an interest in attending and reporting back? The Land Use Bylaw Sustainment team is now moving forward with our initial engagement sessions with communities. We would like to host some sessions to gather feedback from you regarding any thoughts or concerns you have with restaurants situated in both neighbourhood and commercial settings. This could be anything from wanting more or less restaurants, particular styles of restaurants (take-out, fast food, licensed), to impacts on neighbourhoods such as noise or traffic. In terms of dates we are thinking the week of February 24th, however we will certainly adjust dates and times to accommodate as many associations as possible. Depending on interest, we may schedule a few dates to keep group size reasonable and efficient. If you can please indicate your interest and availability in participating it would be appreciated. If you cannot attend a meeting but would like to be involved we can keep you up to date through email. If you have any questions please do not hesitate to contact me. Traffic – the noise, the congestion, the additional parking issues, the increase in car pollution and overall traffic volume of people & cars. Quality of Life – this will definitely decrease with additional housing & commercial activity. Green Space – already it’s minimal green space available to us in the SW downtown area, when comparing to other large urban cities; green space is the necessary balance. Community – Erlton & Mission are beautiful communities that have a village feel within the city, therefore should be maintained. The overall design of this development does not meet the Erlton Redevelopment Plan. remove the requirement that one of the four towers be an office tower. change the number and type of vehicle access(commercial access via Erlton Road) and removal of 24 carparks (as per the TIA). allow a Floor Area Ratio of 4 to be applied to the development ie that the total square footage of all buildings can be up to 4 times the square footage of the total property. Four high density towers being located in this area. This area is primarily single family residential and medium density condos/apartments. To change this to a high density tower with 800 units would totally destroy the character of this community. Allowing commercial traffic on Erlton Road. The ERP specifically states that commercial traffic should not be allowed for this residential community. A large commercial store that is greater than what the ERP has stated. Significant traffic increases to Erlton Street and Erlton Road, which will inevitably happen due to traffic congestion. Worsening of traffic delays and a significant increase in volumes at the intersection of Macleod and 25th. Possible parking problems with apartment users and their guests parking on Erlton streets. Traffic exiting and entering Macleod trail from the service lane, reducing the efficiency of Macleod trail, creating unsafe traffic movements and probable unacceptable delays for exiting traffic. Non compliance with the Erlton Area Redevelopment Plan. 4 years of construction noise and dust. Change the number and type of vehicle access (commercial access via Erlton Road) and removal of 24 car parks (as per the TIA). Liane and I are strongly opposed to all of the above being granted, either wholly or partially. Erlton currently is a fairly quiet, medium density residential community with a good standard of housing and reasonable access/egress to their community, and most of the time also onto 25th Avenue and Downtown. Many residents have bought apartments in this location for these very reasons. Maximum/ Minimum Ofﬁce Floor Area: The maximum used for ofﬁce purposes over the total site shall not exceed 0.92 FAR and shall be no less than 0.46 FAR. Maximum/Minimum Retail Floor Area: The maximum used for retail purposes shall notexceed 0.46 FAR, and shall be no less than 0.22 FAR. Maximum Size of Grocery Store (included in retail ﬂoor area speciﬁed above): 2,800 square metres. The maximum area used for residential purposes shall not exceed 3.44 FAR. We believe the Erlton area plan should be strictly adhered to considering the scale of the development and the mostly negative impact this development will have upon the existing residents. We strongly oppose any commercial vehicle access from Erlton Road or Erlton Street. 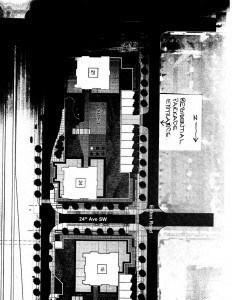 The Erlton plan says that “commercial uses shall not be oriented to Erlton Road frontage”. The plan obviously stipulated this to preserve the amenity currently existing on Erlton Road and prevent commercial traffic using Erlton Road. Their requests for changes to the maximum limits of the Erlton area plan demonstrate that Anthem are ignoring the significant negative effect of their development on the existing residents of Erlton, and in fact seek to exacerbate these negative effects. A larger Sobeys will draw shoppers from other localities. A percentage of shoppers currently using Safeway on Elbow and Sunterra on Macleod would shop at a larger (1000m2 larger) store. The Erlton Redevelopment Plan specifically says that “commercial uses are intended to primarily serve the local population”. A larger store is not required to primarily serve the local population. The proposed store should not exceed the 2800m2 requirement of the Plan. We would also like to know if Sobeys is locked in to the tenancy or are they only a proposed tenant. We would not want to see, for example, a large hardware store replace Sobeys. The city has requested traffic signals at the intersection of Erlton Road and 25th, even though the TAC warrant for signals was not close to being met. Signals have their place, however they also have their disadvantages, as below. If signals are not warranted drivers will become frustrated with the needless delays, especially outside of peak times. Significant increases in the frequency of crashes (especially rear-end crashes). All worsened where signals are not warranted. The TIA undertaken by the developer included a TAC signal warrant study. The results show that signals are not warranted at this intersection. Having said that I believe the data collected by the developer is not reliable. For example, the traffic investigation study made several “assumptions”. Pedestrian delay was not measured. Pedestrian crossing “opportunities” were used instead. Also the SimTraffic model was “unable to simulate precisely the LRT impact”. Traffic volumes were also adjusted “reconciling differences due to counts made in different years”. Why could a thorough investigation not be undertaken with up to date and accurate information? The C train barrier down time of 30 seconds was used. Is this for a 3 car train or a 4 car train? A 4 car train will be in operation in 2015. To maintain the same barrier down time a 4 car train will need to increase speed on the approach. Is this acceptable? the alternative is that the barrier will remain down for a further 6 or 7 seconds based proportionately on the additional length. General assumptions were also made for trip generation percentages, however I do not believe general assumptions should apply due to the limited access and egress from Erlton and the proximity of a major intersection. A traffic count was undertaken on Sept. 11 2012. The count was taken on a fine day with zero precipitation and good visibility. The daily high was +14 degrees. The intersections surveyed would have been operating at close to their maximum efficiency. It is a fact that when it is raining as is the case for much of June, and when there is snow/ice/low temperatures as during the winter months, drivers will allow significantly more time before entering an intersection and move more slowly through it. ie wait times greatly increase for drivers. Wait times can double or triple depending on weather. The traffic investigation should have been done in inclement conditions ie winter/heavy rain as well as fine weather to get a balanced and objective indication of queues and waiting times. Based on the developers traffic investigation the intersection of Erlton Road and 25th is given a current “A” level of service rating. With the introduction of 745 dwelling units in 4 high-rise towers, 69,657 ft2 (6,471 m2) of retail/commercial space, and 3,659 ft2 (340 m2) of office space, 800 odd car parks and the corresponding huge increase in traffic within and outside of the development, the intersection is still given an average “A” rating although the report says elsewhere a “B” or better. I think most residents using the intersection regularly would be more than surprised by such a generous result. Another concern if signals are installed is that traffic from the development (and perhaps some existing residents) will avoid the shorter trip to the new signals on Erlton Road and 25th Ave and use Erlton Street to travel in and out, essentially transferring part of the problem to Erlton Street and 25th. How will this be avoided? By traffic calming measures? We would object to any traffic calming measures on Erlton Street. None are required currently and none should be forced on residents to suit the new development. As a thought, perhaps 24th Ave should be one way (west to east) from Erlton Street making it difficult for the new development traffic to use Erlton Street as an exit choice. According to the TIA this intersection currently operates at a level of service “D”. Including traffic generated by the development, the intersection, according to the developer, will operate with an average level of service of “C” at AM times and “E” (long traffic delays) during PM times, with an “F” for westbound traffic. An F is “failure”. One wonders what the results would be if a survey was taken when it is snowing or in the June heavy rain. Changes to the signal times are proposed giving more green time to north/south movements and penalising Erlton residents who will mostly be using east/west points of the intersection. The proposed right turn from the service lane onto Macleod is a disaster waiting to happen, but there is no other option if commercial vehicles are to be kept out of Erlton Road. Macleod Trail is a very busy road most of the time. Vehicles exiting from the service lane onto Macleod and needing to turn east onto 25th SE will cross three busy lanes of traffic very close to the intersection to make the left turn. The right turn from the service lane should be moved as far north as possible (allowing for safe sight distances) to try and avoid blocking of the access by Macleod trail traffic, and a safer turning movement onto Macleod. The developer expects the proposed changes to the signals and lanes to reduce queue lengths. One would hope all of the assumptions made to support this conclusion are correct or an untenable situation will be created. I do not believe enough work has been done on the traffic investigation to have any confidence in the developer’s data or conclusions. The developer assumes 55% of passby traffic will enter the service road from the north. 40% of traffic will enter and exit via the new service road and the remainder will use Erlton Road and 25th. However, if the right turn exit onto Macleod is blocked by vehicle queues or drivers see it as a dangerous or time consuming movement, they will find an alternative route to take. That will be via Erlton Road or via 24th Ave, Erlton Street (avoiding the new signals) and then south down Elbow drive. In that case percentages change and problems are transferred to another location. The residents regularly using these intersections would be astounded at these conclusions and with the introduction of new traffic generated by natural vehicle volume increases, the huge influx of traffic when the development is completed, and a new Grocery store drawing traffic from further afield, I believe the result will be catastrophic. Based on all of the above we have no confidence in the data and conclusions of the TIA undertaken by the developer. We believe it is unreliable and the traffic problems when the development is fully operating will be totally unacceptable, mostly penalising and inconveniencing existing residents. A new and comprehensive traffic study should be undertaken, in inclement weather as well as fine weather. The study should not rely on a series of assumptions or generic trip generation percentages, and should accurately show current and expected future traffic conditions. The study should use both the TAC signal matrix and the Ontario Traffic Manual Book 12 which is a more objective measurement. If the results of both show signals are not required at Erlton Road and 25th then they should not be installed. The study should be able to predict accurately the effect that normal growth and the development plus commercial uses will have at the intersection of Macleod and 25th. Solutions should comply with the Erlton Area Redevelopment Plan even if this means scaling down the development. The issue of traffic flow and traffic safety is critical for all road users. Therefore best options for the new traffic arrangement should be based on comprehensive, reliable, accurate and up to date information with due consideration for the unique situation that Erlton presents. Parking permits to park on the roads in the current Erlton community should not be issued to owners of the new apartments. With minimal parking allocated to the new apartments the overflow will use any parking available ie within the existing community. Another major concern is shading in the morning. I have been unable to find details of building heights but understand they will range from 15 to 30 stories high. Assuming 2.8m per story the buildings will be from 42m to 84m high. I believe there will be significant morning shading to existing apartments. I understand construction works will begin in 2015 and that the development will take 4 years to complete. We would expect that the developer will be required to comply with City requirements regarding time periods during which construction work are permitted. We would hope that work would not occur on weekends when Erlton residents are mostly home and enjoying the peace and quiet they currently experience. There will be significant pollution (noise, dust etc) during construction. We would not want any relaxation of City rules or regulations to suit the developer. Of concern is where construction traffic will enter and egress the development site. This should be off Macleod trail. No construction traffic should be permitted on Erlton Road or Erlton Street. In my opinion this will require the inconvenience of a temporary speed limit reduction on Macleod for the safety of all. The acceleration lane from Talisman should be extended to the right turn point into 22nd Ave to allow vehicles exiting Macleod to the right, to move out of the way of through traffic as early as possible. The Erlton Plan says that “highway commercial uses intended to primarily serve motorists on Macleod trail are discouraged”. Because commercial traffic is prevented(rightfully) from using Erlton Road, most of the traffic using the commercial uses will access and egress off Macleod Trail. This is totally in conflict with the intended meaning of the Erlton Plan and will impact negatively on the safety and efficiency of Macleod Trail. To prevent backup of traffic down 25th Ave between Macleod and the new signals at Erlton Road the new signals will need to be co-ordinated with the green signal on Macleod. This will mean extra delays to traffic exiting Erlton Road onto 25th. I believe the only acceptable solution to adequately solve the numerous traffic issues is to bring forward the grade separated intersection works at Macleod and 25th to 2020. Funding could be city funds, developer funds and developer contributions with the bulk of the funds secured by a loan taken out by the City. Payment of the loan and interest could be partly by the city, and partly by an annual levy on all apartments and businesses in the new development. The interchange would change the Erlton community forever but the development itself will do so anyway, mostly negatively. An acceptable remedy is required to the present traffic problem and the future traffic nightmare when the development comes online. Of concern also is the recent flooding in Erlton. Flooding occurred in 2005 and 2013. The development will be completed in 2019. I understand the Alberta Government is investigating measures to minimise damage from any future flood event. How long will the investigation take? How long will it take for any measures to be agreed upon, funding found, and acceptable measures put in place. And will these measures protect Erlton from a flood of similar magnitude as the recent flood. Until all of this is known, to forge ahead with a development of such magnitude, one that would be severely affected by further flooding appears irresponsible. The existing road network is totally inadequate to cater for another 6 years of growth plus the traffic generated by the new development. Cosmetic changes will not alleviate the real problems. The development does not comply with the requirements of the Erlton Area Redevelopment plan and, due to the scale of the development, it cannot. It is simply the wrong development for the area. However the development has been approved and should be made to comply strictly with the Erlton Area Redevelopment Plan. A more thorough investigation of the traffic issues and solutions is required. The grade separated interchange should be brought forward. 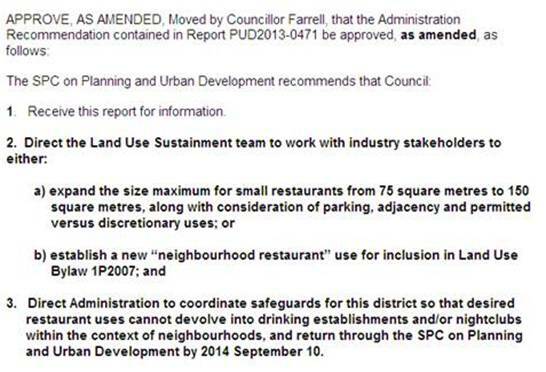 Non-compliance with the spirit and intent of the Erlton Area Redevelopment Plan. We believe that the outcomes from this development as proposed are overwhelmingly negative for Erlton. While waiting for the City to post their review of Anthem’s transportation impact assessment on the Calgary.ca/erltonroad web site for further comment, we’ve had the opportunity to review the material in depth. The preferred scenario is to have all non-residential traffic enter and exit, right-in, right-out via Macleod Trail. This in conjunction with 24th Avenue terminating at a cul-de-sac at Erlton Road to prevent short-cutting from Macleod Trail to Erlton Road. The cul-de-sac could be replaced with gates or other traffic limiting devices designed to open for emergency vehicles such as fire trucks, etc. The less favoured option, provided the owners / residents of the nearby condos generally support it, is to allow non-residential traffic to enter the development via the south parking entrance but exit only via Macleod Trail. Again in conjunction with a cul-de-sac or other traffic limiting configuration at 24th Avenue and Erlton Road to prevent non-residential back-flow into North Erlton. We’re still waiting to hear back on any positions adopted by the condo boards and the LPCA based on their conversations with their owners / tenants. The rationale for all of this is based on the fact that open houses in 2006/2007 drove the traffic wording that is currently in the existing DC bylaw and our Area Redevelopment Plan. We believe that it would be difficult to make major changes without a further open house whereby all reasonable traffic routing is again up for full discussion. Additionally, the traffic lights at 25th Avenue and Erlton Road may actually cause a problem in South Erlton. By further backing up rush hour traffic, we believe it will encourage more east-bound motorists to turn right (south-bound) on Erlton Street at 25th Avenue and short-cut through the community via 27th, 28th, 31st, and 34th Avenues in order to reach Macleod Trail. This problem occurs now, and has been the main traffic complaint in South Erlton for many years. The City must be prepared to address this issue to determine a solution that the majority of residents in South Erlton will agree with. It explains the review process, the past and present changes, and offers the opportunity to review and submit comments. This is a timely opportunity for anyone with an interest in the Anthem project, and traffic resulting from it, to comment. We’re sending this to the Presidents of the various North Erlton condo boards, with the request that they email it to the owners / residents of their buildings, and post it in their lobby. We’ve recently heard that this information is not being circulated to those who will be most affected by these changes. The attached table summarises information related to existing and post-development traffic on Earlton Road just north of 25 Avenue SW. In terms of traffic volumes, total existing daily traffic is estimated to be at 1372 vehicles per day (veh/day) and post-development daily traffic at 5502 veh/day. Around 55 per cent of the new site-generated traffic would be attributed to commercial uses, around 2300 veh/day. To accommodate the additional (site generated) traffic, improvements like new signal and new southbound left-turn lane are proposed at this intersection. In terms of the intersection performance for the post-development (improved) road cross-section, level of service is estimated to be at “A” (excellent), where only 12% of the future capacity on Earlton Road is going to be used by all vehicular traffic (existing + post-development). Floor 7, Municipal Building – H7, 800 Macleod Trail S.E. Thanks for the contact info, and I hope you found our last night’s AGM informative. I’ll add you to the distribution list for further communications. Your suggestion that a notice be posted in the lobby of each building, and an email sent by the condo board to each resident is a great idea! Please follow up on that with the management of your building. I’ve also attached (comment 1, comment 2) our community comments relating to this DC Bylaw, and you can find more on our community website at www.erltoncommunity.com – look for LOC2012-0040 (Anthem) under the Planning & Development menu item – it’s currently the second item in the list. I’m also sending a copy of this to the Presidents of the various condo boards, in the hope that they will forward it to the residents / unit owners in their respective buildings to enable them to participate. The City has created an information website for the current Land Use Bylaw application and changes to the Erlton Area Redevelopment Plan – with respect to this Anthem development. It is currently working on them as well as a Transportation Impact Analysis for the area. I am the Board president for Waterford AB and Lynda McNie is the Board president for Waterford CD (she is cc’d). I can only speak for Waterford AB, but our Board would like to participate in future meetings or discussions regarding this development. There appears to be considerable confusion in regards to this development. Most Waterford AB residents are very concerned over the impact this development will have on our community. Population increase, traffic (25 Ave & McLeod Trail intersection), and parking issues are the main concerns. The feedback we received at the recent Waterford AB AGM is that residents feel the change to high density in 2007 was not effectively communicated to the community. Furthermore, most residents purchased their condos in the Waterford AB believing that future development in the community would be medium density (based on the Erlton Community Plan posted on the City of Calgary website). Further, there appears to be confusion over whether this development is approved or whether there is still time for community input. I spoke to Giyan Brenkman a while ago. Based on that conversation, I believed this development was approved and it was too late for community input outside of the three changes noted in my previous email. Perhaps I misunderstood as I don’t have a robust understanding of the development and building permit process. Waterford AB residents would welcome an opportunity to learn more about this development, understand where it is in the approval process, and be given a chance to voice their concerns. Thank you copying us on your email, Mr. Jackson. There is no approved building design. That comes later, and involves a Development Permit application which allows a full review by the our community association and all Erlton residents, both North Erlton and South Erlton. Anthem intends to hold a meeting to discuss the traffic circulation into and out of their development in early to mid-October according to the latest information I have. I have you on my circulation list, and I’ll let you know when and where. At that time, I would like to have the President of each condo board attend, with the mandate to speak on their owners’ / residents’ behalf to traffic and any other issues that are raised. Unfortunately I do not have contact information for each condo board President. If you do, please share it with me or forward this to them. At last night’s AGM there was a request for information regarding the development that will be built on the empty land between Erlton Road and MacLeod Trail (the “Development”) (City of Calgary File LOC2012-0040). The following email is in response to this request. The land is owned by Anthem Properties. More information about the Development can be found on the Anthem’s website www.anthemproperties.com. According to the Anthem website development is to start in 2014. The land was re-zoned from low & medium density to high density in 2007. As a result, the Development will be high density commercial / residential mixed use. The Development will comprise approximately 800 residential units in four towers ranging from 15 to 30 stories. The residential towers will sit on a platform that houses commercial units, including a grocery store, facing MacLeod Trail. Townhomes will be on the ground floor facing Erlton Road. Underground parking will be on a 1 to 1 basis (i.e. approximately 800 residential parking stalls) plus additional commercial parking stalls. A request to removed the requirement that one of the four towers be an office tower. A request that the commercial space designated for a grocery store be increased in size to satisfy the proposed tenant (Sobey’s). A request to change the access to the parking garage, which would increase commercial traffic on Erlton Road. At the AGM, residents of the Waterford AB expressed concerns over potential problems, caused by the significant increase in population, vehicle traffic and parking, that the Development will bring to the community of Lindsay Park (formerly Erlton North). Waterford AB Residents wanted to know what the City of Calgary was doing to address and/or mitigate these potential problems. I do not have a direct email for the Lindsay Park Community Association, but if you cc me I will forward on. Additionally, you can contact Anthem Properties through their website. I am the President of the Waterford AB Condominium Board located at 2419 Erlton Road SW and 2422 Erlton Street SW. I am writing in regards to the Anthem Properties development planned for the empty lot on the East side of Erlton Road SW in the Community of Lindsay Park (LOC2012-0040). Since the flood, I have a renewed opposition to this development. I have concerns that the Lindsay Park Community (the Community) cannot support the population density and vehicle traffic that a development this size will create. I believe this development has grown significantly in size since initially proposed and no longer aligns to the Erlton Area Redevelopment Plan approved by City Council (http://www.calgary.ca/PDA/LUPP/Documents/Publications/erlton-arp.pdf?noredirect=1). My understanding is that this development will now comprise four towers, which is not in keeping with the Community. Further, I understood that the Community was to be low to medium density. I consider a four tower project to be high density. High density projects are unacceptable in this Community. The Community, which is only four square blocks, cannot support the population density that a development this size will bring. Our roads and intersections are at capacity. Street parking is limited and does not support current demand. Erlton Road, with two existing parking garage entrances can not support the increased vehicle traffic that a third parking garage entrance will create. The intersections at Erlton Road & 25 Ave SW and 25 Ave & McLeod Trail SW are currently at maximum capacity and constantly backed up. It is my understanding that the developer recently requested a change to the development plans that will bring commercial traffic onto Erlton Road. This is unacceptable. I was told by Anthem Properties that the development may be built as a rental property. This is unacceptable. I believe restrictions to the type of commercial properties allowed at this project are necessary. We already put up disruptions to our Community as a result of the commercial activities of the Stampede. We do not need to experience these disruptions year-round. Lindsay Park is a residential community. Commercial activities should be in alignment with a residential community. I do not believe that a development this size should be built until its affect on the the community, if another flood was experienced, is understood. The Community was and continues to be stretched to the maximum as a result of the flood. A development of this size will double the population in the Community. I view this population increase to be a safety issue should another flood occur. Furthermore, I believe that the residents of Lindsay Park deserve to understand if this land would be better used as part of a future flood mitigation plan as opposed to further residential development before this development is approved. I would like to know where I can obtain further information regarding this development. Furthermore, I would like to understand what has been done and what will be done to gather community input. I plan on sharing this information with the residents of the Waterford at our upcoming annual general meeting. Discussions between the City, Anthem Properties, and the Erlton Community Association with respect to a new Direct Control Bylaw and associated amendments to the Erlton Area Redevelopment Plan have been ongoing for over a year. What we consider to be the final drafts of the DC Bylaw and ARP are attached for your information, and were ready to go to the planning commission and City council for ratification. However, last week I received a call from Anthem wanting to now amend Section 17(2) of the DC Bylaw and item 10 of the ARP proposals to allow commercial traffic to use the Erlton Road residential parkade entrance to access commercial parking for the businesses on the Anthem lands. An image of the location of the Anthem residential parkade entrance is attached. These final drafts have firmed up this commercial vehicular access issue in both the DC Bylaw and our ARP, and as far was I’m aware are supported by the City’s Planning and Transportation departments, since they studied, negotiated, and wrote these documents. Our community had significant input, with the City resolving a number of contentious issues in favour of the residents. I believe there may be significant lobbying to remove these particular vehicle access protections for the residents in North Erlton, particularly those on Erlton Road. Please do not hesitate to contact us should you have any concerns or require further information. 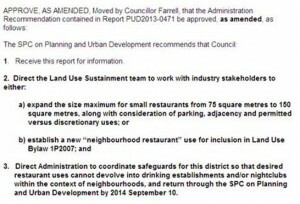 This is supplemental to our April 28th comment on this DC Bylaw and Erlton ARP amendment. We have reviewed the draft of the DC Bylaw wherein Custodial Care, Special Function – Class 1, and Special Function – Class 2 uses are excluded or prohibited. We find that the DC Bylaw now fully resolves all concerns we expressed with respect to these uses. The social disorder resulting from the Special Function use emanates from patron activity – and the evidence the following morning – due to the serving, and over-serving of alcohol, the loud music, and the late hours of operation. It will severely impact the right to quiet enjoyment of a large number of nearby residents – both current and future. This use is presently available across Macleod Trail in Stampede Park, and its presence here in Erlton is not conducive to our objective of being a complete, mixed-use, family-friendly community.